Biron will oversee new residentialcommunities and the professors directing them and work on issues of student inclusivity as well asdiversity, according to a College press release. Her role will also involve leadership in admissions and financial aidstrategic planning. Biron has been a faculty member since 2006 and previously served as associate master of Pearson Residential College at the University of Miami, living in a residence hall where she worked on programming, leadership and advising for the students.She will work with the six house professorsselectedin May to plan the new residential community program over the next year. Changes to the Dean of the College positionannounced in Aprildictated that the next deanwould be a tenured faculty member. Reorganization of the division has focused the role more on direction ofacademics at the College, including integrating academics in student life beyond curricular learning. Biron's appointment as Dean of the College is for a four-year term.Biron will continue to teach after she assumes her role as Dean. Interim Dean of the College Inge-Lise Ameer will take on her new appointment as vice provost for student affairs on July 1.Ameer was selected for the newly created position inApril. Biron said that thoughher goals are "prettygeneral," theyalign with the organizational change in the Dean of the College role. "My main goal is just to be an effective liaison between academics and student life," she said. Biron said that she believes that the Dean of the College division has always been strong, but that the restructuring of the dean's role allows for a clearer focus. The Dean of the College's role prior to this restructuring was "getting far too big and wieldy for one person to do," she said. Biron also emphasized that having a faculty memberserve as dean is "radically important for keeping the educational mission of the College front and center in every aspect of student life." Biron said that her experience at the University of Miami showed her that residential college systems allow the entire institution to benefit from the knowledge that students bring with them that may not be directly related to classroom learning. "A house system allows us to take advantage of what the students bring to the community," she said. "And to think of all of us together as a learning community will end up providing a rich resource for everyone." Biron added that she hopes to work with the new house professors to "enhance" the plans that they already have. She alsoadded that she hopes to "keep an experimental attitude in the forefront" of the implementation of the residential system. "This is a community effort, and everybody is going to get to participate," she said. Biron stressed that there are already existing opportunities for "co-curricular learning," such as the Dartmouth Outing Club, various service and leadership programs and the Greek system. Biron said that her work will consist of determining how to bring these various, existing outlets into a more productive coexistence. "In an ideal universe, what we want Dartmouth students to have is a transformative experience that prepares them for lifelong learning and leadership," she said. "A baseline requirement for that is inter-group, inter-cultural communication skills and learning how to really activate respect across social differences." 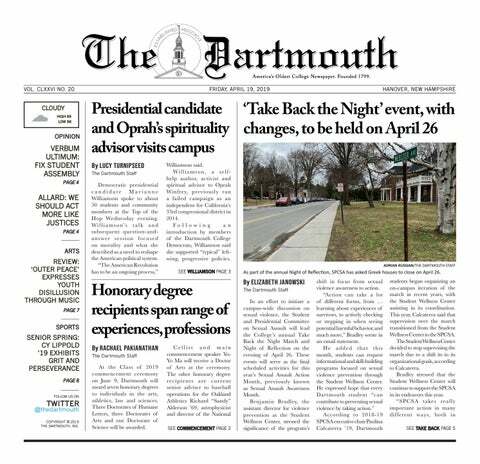 Biron said that, in general, the "Moving Dartmouth Forward" policy initiative, which called for the residential house system's implementation,aligns with her goals to improvecommunication between student groups and create more of a "24-7 learning community." "Where there is student resistance to ["Moving Dartmouth Forward"], or student resistance to anything in terms of organizational change, I would just want to encourageeverybody to recognize that all of us want to make the residential learning experience here deeper and more fun for everyone," she said.